(Michael Barnes, Liberty Headlines) When the sheriff-elect of North Carolina’s most populous county campaigned earlier this year on ending a partnership program with U.S. Immigration and Customs Enforcement, critics and elements of the local law enforcement community warned that move would have unintended consequences. Namely, that ICE would be forced to ramp up its presence in Mecklenburg County — which encompasses the nearly 1-million-resident city of Charlotte — as the federal agency would no longer be able to rely on local law enforcement to help apprehend criminal illegal aliens. 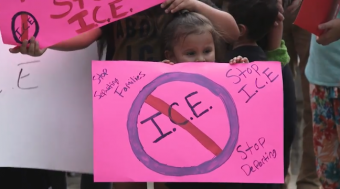 A ramped-up presence could lead to unforeseen problems, critics contended, amid the campaign’s politically charged anti-ICE rhetoric. Although there are still several months until Sheriff-elect Garry McFadden, a Democrat, will assume office after an uncontested November election, the consequences of his promise may already be taking root during the lame-duck months of the current sheriff’s term. In perhaps a sign of more to come, the Charlotte Observer reported a scene at the county courthouse on Friday that has illegal immigration advocates crying foul, while perhaps confirming the suspicions of those that saw such incidents on the horizon. A Columbian national identified only as Maria was temporarily detained by ICE agents when she appeared in court last week for a domestic violence proceeding. With the help of public interest immigration attorneys, Maria had previously filed a protective order against her fiancé who had allegedly assaulted her and her 16-year-old son. The pair had been relocated into a domestic violence shelter along with the 2-year-old child of Maria and her fiancé — of which there is currently a custody dispute. The fiancé filed a counter domestic complaint against Maria, which was the reason she had appeared in court. Maria and her son were handcuffed at the courthouse and taken to be processed at a nearby detention facility. They were expeditiously released and her 2-year-old remained in the courtroom daycare during the 6-hour ordeal. Kevin Tully, the county’s longtime public defenderwas beside himself. “The message is very clear: Come to the courthouse at your own risk of being arrested and caged by the federal government,” said Tully. “If they are victims of crime, their willingness to participate with police, from the outset, is going to disappear,” he added. But that’s exactly what critics like outgoing Sheriff Irwin Carmichael warned against when McFadden made abolishing the immigration partnership with ICE, known as “287(g),” a main campaign theme. Carmichael, whom McFadden defeated in a May primary, was targeted by left-wing immigration protestors for his support of the program. The 287g ICE initiative allows local law enforcement deputies to act as immigration agents. Deputies can check an immigration database to determine whether arrested criminal suspects are in the country illegally. If so, they have the discretion to notify federal officers of release dates, which could lead to deportation in egregious cases. “The bottom line is, if we’re not able to take these persons into custody in the jail, we have no other choice but to expand ICE resources to go out into the community and look for them and find them ourselves,” an ICE spokesman told WFAE in May. “And in doing that, it significantly increases the likelihood that we may come across other unlawfully present persons – who weren’t even on our radar – and those persons could be taken into custody as well,” the spokesman said.